Things were starting to warm up for most of the United States throughout last week, but for those hoping it would last into the weekend, I have some bad news. Temperatures are expected to be as much as 30 to 50 degrees below normal. Although many Americans hope for warmer weather as we get into March, that is simply not the case. Throughout the weekend brutal temperatures are going to overtake the central portion of the country, from the Mexican to Canadian borders. Currently, things are very cold in the northern Rockies, Plains, Midwest, and Northeast, temperatures are expected to drop by as much as 20 degrees below 0 in some places. This is thanks to the arctic air mass, which could continue well into the second week of March. 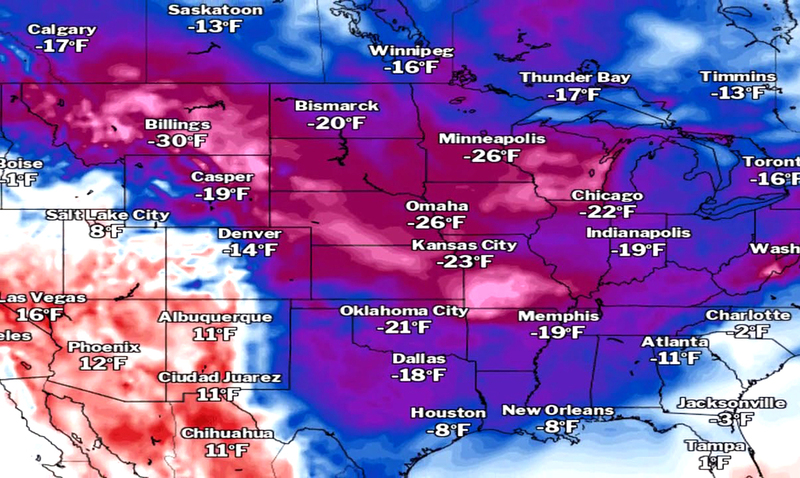 According to Fox News, This cold is due to a “block jet-stream pattern in the Arctic.” A high-pressure area from the Gulf of Alaska will push the cold air southward into the rest of the country. Subzero temperatures are anticipated as far south as Colorado, Kansas, Iowa, Illinois and even into Texas. By Tuesday, highs are expected to hover in the teens, except around freezing in the corridor from Washington to New York.